I still remember moving in with my husband — at that time he was my boyfriend. I remember us making an agreement that we would always sleep in the same bed no matter how angry we were at each other. The couch was not an option. Fast-forward to having children, things began to change. After our first baby, we managed to keep this agreement alive with the occasional third person in our bed. However, after our second baby, that agreement became null and void. By our second, we had downsized to a one-bedroom apartment that cozily fit four humans and a dog. Options of where to sleep were limited. My husband and I began sleeping apart the day our daughter was born; he would take our son to sleep with him on the couch in the living room so that they could get rest while I stayed up feeding and rocking our newborn to sleep. The weeks became months, and then the months quickly turned into two years. My family’s sleeping arrangement for the past two years depended on how the kids were feeling. (Forget how Mom and Dad were feeling.) We would unintentionally play musical beds, but my husband and I never managed to share the same sleeping space. Our children, for the most part, slept in the bedroom with me while dad slept in the living room. I felt like a mama bear appeasing her cubs in the cave while papa bear kept the entrance safe. 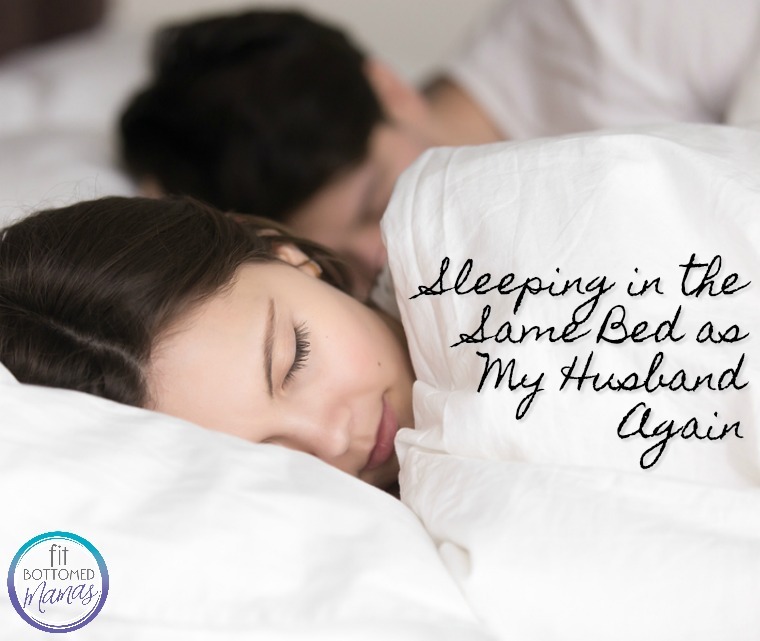 To say that I was excited to have my husband back in bed is an understatement. My excitement was actually a surprise to me because motherhood has always come before my marriage, not by choice but by instinct. I embraced the good feelings and welcomed my life partner back into the space that was overtaken by our children. Sleeping with my husband again has been wonderful. I have been feeling like a girlfriend again, like my husband and I are back in college only with extra roommates. We have been late in getting up every day since back in bed together. It has been comforting to have my husband to cuddle with, and I am aware that this reawakened passion may fade again, but in the meantime, we are making the most of having each other to spoon with.